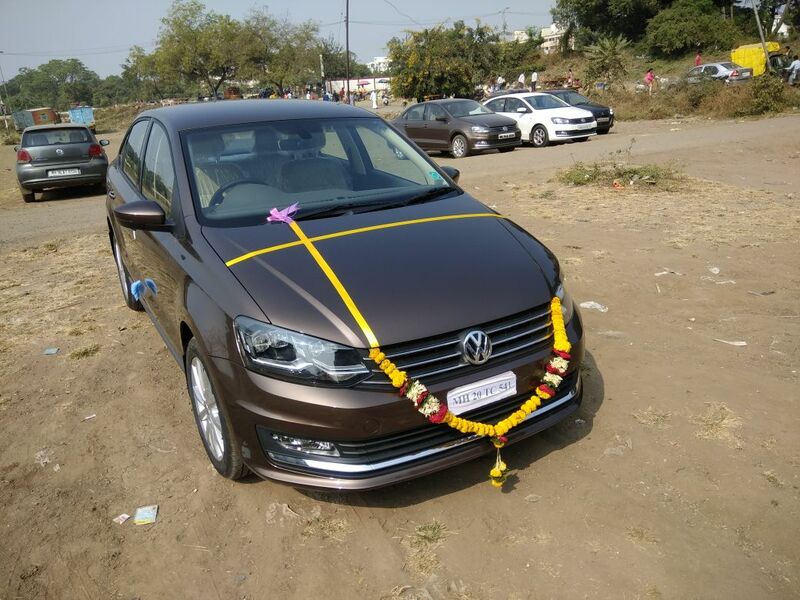 After a lot of R & D for a mid-size saloon, trying out everything out there and also the used car market, the decision was finally made to go for the VW Vento petrol. Buying the diesel didn't make much sense to us, as our daily running is as little as 3 km, although the diesel Vento is the default choice when you look at Volkswagen. Popular word-of-mouth and also the sales charts defined a no-brainer decision to go for the Honda City, but I personally think that there is too much hype around this car. Firstly its no Audi or BMW, to give your eye and teeth for. And in Mumbai its so common on the road, and there are in fact four Citys just around my parking space in my society. For some, its comforting and re-assuring to buy such a car, which is so popular, efficient, stylish, and which commands good re-sale value (which is also a myth). I'm a true petrolhead, so it takes some more convincing than that to lure me. During test drive and I really liked the planted and stable feel of the Vento. That was the older diesel model, which in fact is fabulous. Honda City in contrast was coming off as too eager and in-your-face. I like the understated and classy looks of the Vento, the well finished interiors (although dated compared to the flashy counterparts) and the solid build quality. As I always think and would advise anyone looking to buy a car: a car is also a reflection of your personality, something that you can be comfortable living with. The Vento did put a smile on my face, ultimately that's what a car should do to you. You may have the best car in the world, but still not like it. Car enthusiasts will agree to that, but someone who wants a car just for the sake of it, wouldn't care. I have always looked after my cars very well and get emotionally attached to them, and I care about them. So I did sign the dotted line for the manual petrol Highline version, which was perfectly suited to my needs. As a driving enthusiast, I never really favoured the auto box. My only compromise would be a dual-clutch system with paddle shifts, if I ever did. The Vento Auto doesn't have paddle shifts (sorely missed with such a lovely DSG unit), so that didn't excite me much then. But after some careful after-thought I decided to take a test drive of the auto version, which in fact altered my buying decision. I was impressed by the utter smoothness of the car and how stress-free it was, a boon in Mumbai's chaotic traffic. I knew that this lady could dance if required, with soul of the Polo TSi and the brilliant Sport mode. That was everything in one box, understated and classy on one side, and a raging bull when called for. So I changed my mind and upgraded to the 1.2 DSG Highline model. I'm glad I made that decision, because I absolutely love the car now, the seven speed DSG unit is a breeze and the highlight of the car. Frankly the popular grouse about the car, that the gearbox is jerky, was never a concern for me, and it rarely felt so, that too only during abrupt braking. If you drive normally and brake smoothly (which is the way you should, unlike many road users), the gears fall into place without any fuss. And the talking point of the DSG unit is the engine braking it provides, sometimes you can revel at the way the car slows down with negligible use of the brake, if you plan your braking in advance. Another notable feature is that the reserve power that is always on tap, just floor the throttle and the car responds beautifully at almost any road speed. I think that kind of response is not really possible with a manual gearbox, unless you are clever in its use. And I rarely found the need to use the sport mode, the engine is powerful enough in normal mode, at least in Mumbai's chock-a-block traffic. I had a brief stint with the Vento on the Mumbai-Pune Expressway, but sadly it didn't impress me there as much as it did in the city, especially on the curves. I have read that the traction control system is the culprit, which makes the car under-steer a lot. In fact it was recommended to turn it off to enjoy the drive better... got to try that one sometime, obviously when its dry and safe to do so. But let's face it, how many cars we drive have traction control, on this side of the luxury cars?? How much traction control and ABS did the Ambassador have, that I grew up with... :-) So I'll worry less about that one, and I'm not a lunatic when it comes to driving. As far as fuel efficiency is concerned, the car is doing ok for its class. In city with bumper-to-bumper traffic, it gives me about 10 kpl. Can't really blame the car for that, how can it return any fuel economy when its hardly moving!! The fuel economy greatly improves on the highway to about 16 to 18 kmpl, which is quite respectable. On the whole it has been a good ownership experience, the car's quality outweighs Volkswagen's pathetic after sales service. The good part is that the car rarely visits the service center! The buying experience at the dealership was terrifying to say the least, and its best not spoken about. And the best part about the dealer too is that they stay out of your way once you buy your car! Nicely written, your review on Petrol vento. Very detailed and touchy. Honda city and VW vento price is almost same. Where as power output of vento is less by 14hp as compared to Honda city so is the pickup from 0~100 km/hr as per Autocar. From the front vento and polo appears similar. None of the models of vento has traction. Vento's fuel average, as per ARAI, is also less. VW owns: Audi, Bentley, Bugatti, Lamborghini, Porsche, and overseas-brands SEAT and Skoda. But keep everything aside, when you love your Ride then it remains UNIQUE. Happy motoring. Many thanks for your reply, yes as you said, you should love your ride, rather than buy one car and think that "oh, I should've bought that one". Honda City is no doubt a great car, with fabulous engines in terms of performance and efficiency. One good thing about the cars from different manufacturers is that they have very distinct personalities, which gives an opportunity to really choose the one which you like. Off late Honda is losing its favour in the market, and cars like the Ciaz and Baleno are giving it a run for its money. Nicely written review.. I took a similar decision from my heart and went for a Toffee brown Venti TSI highline plus with 16 inch wheels. I ve driven it around for 600 odd KM's. 2. Classy looks esp brown colour..
3. Excellent ride and handling. 4. DSG gearbox is probably the best automatic gb we can get at this price. Works absolutely great especially with upshifts. 5. Mileage of around 10 kmpl in the city and 15 kmpl on the highways. 6. Buying experience was pretty good in spite of slight delay. 1. NVH levels in the cabin are not that great. Especially on the highways at higher speeds, engine makes itself quite audible inside the cabin in addition to the tyre noise. 2. Accelerator not as smooth as other competitors like Honda City CVT. Though it's too early to come to a conclusion, I am happy with my decision of choosing Vento TSI over City CVT.